If you’ve ever seen a beaver going about its business processing a tree you probably admired how efficient and industrious these little creatures are. They can easily go through some logs that would give some of the biggest and strongest lumberjacks a workout to remember. The reason the beaver is so good at falling trees is because it’s versatile and adaptive to its surroundings. You’ll probably never be as efficient as a beaver at chopping wood, but with the right chainsaw you can easily come a close second. There aren’t too many chainsaws on the market that I would consider truly versatile, but there are always one or two exceptions to every rule. If you’re looking for a versatile chainsaw that can be used in different situations then the Blue Max 8902 is one option you may want to consider. This is a machine that actually allows you to switch between different blade bar lengths while still providing enough power to get the job done. When you purchase the 8902 by Blue Max you get two separate blade bars in the package. It includes a 14-inch blade bar and a 20-inch blade bar. The 14-inch bar is perfect for small work such as bucking small logs and is ideal for most backyard pruning activities. When you need something a little more heavy duty you have the option of switching over to the 20-inch blade. That type of versatility makes this an attractive option in the home chainsaw market. Versatility is great, but that doesn’t mean you want to sacrifice safety. When working with any sort of power tool, safety should always be a paramount concern. This chainsaw is also equipped with a rapid reaction chain brake that prevents injury due to kickback. That’s not something our friendly little beaver would ever have to worry about, but it is a concern for the rest of us so it’s comforting to know you have this protection. The chain brake isn’t the only safety feature on this machine; it also has a hand guard to protect your hands from flying debris, and it has a safety trigger which automatically disengages the power to the machine if your hand slips off it. While no safety system is 100% effective, the various safeguards in place with this machine are great features to have. When you’re in the middle of a cutting job the last thing you want to worry about is making sure that the chain has enough oil on it to continue functioning efficiently. It’s not something you can ignore though, because cutting through wood creates a lot of friction – you need to make sure your machine has enough lubrication if it’s going to keep working. 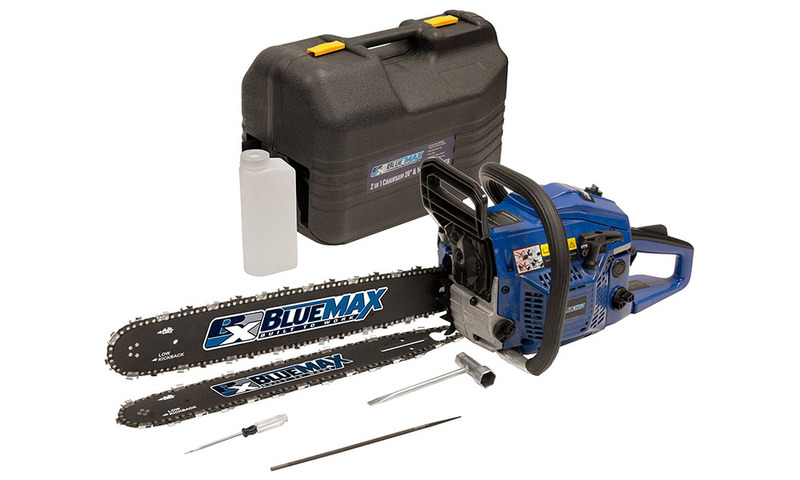 With this in mind Blue Max has included an automatic oiler with this chainsaw that takes care of the job for you so that you can concentrate on chopping up some wood. It really is a great thing that this chainsaw comes equipped with two separate blade bars to choose from, but it would be a little awkward trying to lug those around without some sort of case. Not to worry though, this chainsaw includes a carrying case for convenience. The blades are easily disassembled from the machine for easy storage and the whole process only takes a few seconds. That way you can keep everything stored together and you won’t have to worry about missing parts when you need to use your chainsaw. While I do like a lot of the features of this chain saw, one thing I don’t like is the fact that it weighs almost 24 pounds. That makes it one of the heaviest chainsaws in the home market and having to work with a power tool that heavy can be quite cumbersome. It won’t take long before you feel that in your shoulders and in your back. When using this machine you’re probably going to need to take frequent breaks; that’s definitely a bit of a drawback. One of the main reasons that this chainsaw weighs so much is because it’s equipped with a pretty powerful internal combustion engine. It’s a 45 cc model and that type of power allows it to run at up to 2800 RPMs. That’s more than enough power to cut through most of the jobs you’ll be using it for in your backyard. It may not be appropriate for lumberjacks, but for the rest of us it will handle just about any job that we have for it. There’s nothing more frustrating than trying to use a power tool only to find out that you can’t get the machine started. I have to admit I’ve cursed at more than one lawnmower in my day for this exact reason. This chainsaw has a quick start engine that’s designed to start after only one or two pulls on the cord. This will minimize the wear and tear on your body and the machine itself – assuming it works as advertised. While the Quick Start feature does seem like a great option in theory, it has its critics. A fair number of customers have complained about problems getting this machine started and that’s definitely something to be concerned about. It’s probably something you could easily dismiss if it was just one or two customers with this complaint, but unfortunately that’s not the case. The Blue Max 8902 Chain Saw is a machine I really wanted to like because of its versatile nature. There aren’t many other chainsaws on the market that allow you to switch out different length bars, but that doesn’t make up for the fact that this one has a reputation for inconsistent starts. I’m kind of on the fence with this saw and I’d probably recommend considering other options.